To start my first Friday Finds, I bring you this random collection of books that I've added to my TBR list recently. First up, we have The Trial by Franz Kafka reviewed by Amanda at The Zen Leaf - I've only ever read Metamorphosis by Kafka. I'd considered some of his other works, but I wasn't sure about them. Mostly because it all seems so serious. I was a bit on the fence about whether it'd be a struggle to get through it, or if it'd be interesting enough to sustain my interest. The thing is, I'm not sure that I've ever known what any of his books are about. So when I saw this review, I was quite pleasantly surprised. What really made me want to read this book was reading about Amanda's take on The Trial and she went over a lot of the themes of the book. And that was helpful. I think for me, Kafka would be a bit like I found Shakespeare. Once I had a rough idea of the plot beforehand, I really enjoyed it. Well, I say that before I attempt it, but it's one that I won't continue to discount. Next, The Red Tent by Anita Diamant reviewed by Wendy at Musings of A Bookish Kitty I'm really glad that I read this when I did, because shortly after, I found this book in a charity shop. I'd heard of it before, but, like Wendy, I was hung up on the biblical aspect of it all. I was intrigued by Wendy's review. She wrote just enough about the characters and some of the women's traditions to have me intrigued as to what she meant. I wanted to hear just a little bit more, and I realise that when I want more from a review that it means I really must read the book for myself. Her name is Dinah. In the Bible her fate is merely hinted at in a brief and violent detour within the verses of the Book of Genesis that recount the life of Jacob and his infamous dozen sons. The Red Tent is an extraordinary and engrossing tale of ancient womanhood and family honour. Told in Dinah's voice, it opens with the story of her mothers - the four wives of Jacob - each of whom embodies unique feminine traits, and concludes with Dinah's own startling and unforgettable story of betrayal, grief and love. Deeply affecting and intimate, The Red Tent combines outstandingly rich storytelling with an original insight into women's society in a fascinating period of early history and such is its warmth and candour, it is guaranteed to win the hearts and minds of women across the world. Purple Hibiscus is wise, perceptive, subtle, and perfectly paced. It’s a story of political unrest, of gender and power, of religious fundamentalism, of faith, of freedom, of growing up, and of first love. Longlisted for the 2004 Man Booker Prize Shortlisted for the 2004 Orange Prize A haunting tale of an Africa and an adolescence undergoing tremendous changes by a talented young Nigerian writer. The limits of fifteen-year-old Kambili's world are defined by the high walls of her family estate and the dictates of her repressive and fanatically religious father. Her life is regulated by schedules: prayer, sleep, study, and more prayer. When Nigeria begins to fall apart during a military coup, Kambili's father, involved mysteriously in the political crisis, sends Kambili and her brother away to live with their aunt. In this house, full of energy and laughter, she discovers life and love - and a terrible, bruising secret deep within her family. Centring on the promise of freedom and the pain and exhilaration of adolescence, Purple Hibiscus is the extraordinary debut of a remarkable new talent. And also, Who Killed Amanda Palmer with stories by Neil Gaiman reviewed by Nymeth at things mean a lot - I have to admit, I've never heard Amanda Palmer's music. I know next to nothing about her except what I've read on her Twitter feed over the last few weeks. But this just looks like an interesting book. Stories by Neil Gaiman? Sold. This book is a companion to Amanda Palmer's new CD of the same name. It has words accompanying each of the pictures she has had taken of herself, written by Neil Gaiman. She's dead in all the pictures, different ways and states each time. So that's the basics, but it leaves me wondering how to describe it to you, if I call it beautiful, it disregards the visceral pictures, the gritty, horrifying pictures of Amanda bloodied in a shopping trolley, or left in a dark alley. If I say it's horrifying, it denies the superb photography of the book, the cadence of Neil's fitting words, the attention to detail in the pictures, and the shots where Amanda lies serene and peaceful. The only thing to do then, is describe it as this: spectacularly unique. 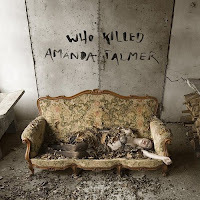 Combining the lyrics of her latest album, with short stories by Mr. Gaiman, and photos that seem to have been collected over many times and situations, Who Killed Amanda Palmer is both frightening, absorbing, artistic, and just a little fascinating. It's not a book for everyone, but for Gaiman fans it's a definite read, For Palmer fans it's a sure-bet for a look. And for fans of both - it's an absolute must buy. Phew, I had fun with that. See you all next week! Friday Finds is hosted by MizB over at Should be Reading. I've never heard of Amanda Palmer either but the book does look interesting! I *really* want to read The Red Tent one now!! The Red Tent - I NEED this one. Nymeth is really a bad influence on our TBR lists, isn't she? They all look fabulous. I would definitely like to have a look through the one by Neil Gaiman and his girlfriend - the pictures look amazing. Good luck with The Trial. It wasn't my favorite of Kafka's works, but it was so much easier to understand and like once I unraveled the themes. I agree that Kafka is far better to read if you understand what you're going into ahead of time. The Amanda Palmer book gives me the chills. It'd be exciting to read it late at night! I read The Red Tent several years ago and LOVED it!